Mandela Month in 2014 will be particularly important as it will be the first year Nelson Mandela’s legacy is honoured without his presence. To commemorate the legacy of the well-loved leader, Monash South Africa has embarked on a month long book drive with the aim of collecting thousands of books for the local communities. Monash South Africa’s Mandela Month Book Drive, which was launched today at its campus in Rumisig in partnership with Spell It and Nedbank Capital, aims to help more children in under resourced schools have the joy of owning their own books. Monash South Africa believes that access to education empowers and enables children and youth while having a lasting positive impact on learners and the communities wherein they serve. Both staff and students of Monash South Africa share their skills and time with the community regularly. “We’re especially proud that the Mandela Month Book Drive grew from a project of Monash student Oliver Moraes, who visited our campus on an exchange programme from Australia in 2012. 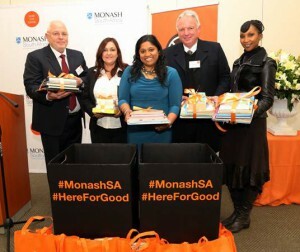 His generous efforts helped collect nearly 3000 kg of books from friends and businesses, estimated to total about 8 000 books,” said CEO of Monash South Africa, Esther Benjamin. “This year on Mandela Day, 18 July, we will be delivering packs of books to Early Childhood Development centres in Zandspruit. Additional bags of books will be delivered to public schools in our area when they reopen after school holidays,” she said. “We believe that access to education can and should empower and enable our students, having a lasting positive impact on them and on the communities we serve. Our students grow as leaders and benefit themselves as they develop important skills-set sought after by employers such as leadership, communication, and project management,” added Benjamin. “Community engagement is an important part of the learning experience as we firmly believe it is important that our students have a well-rounded and holistic education. In the first half of 2014 alone, our students volunteered more than 2 700 hours,” says Benjamin. The book drive is one of the many initiatives led by students for other students and Monash South Africa has called on its education partners to embark on similar initiatives at their schools. Monash South Africa has been in existence in Johannesburg since 2001 and currently has over 4000 students studying in 4 schools – Business and Economics, Social Science, Health Sciences, and Information Technology. The institution also offers a Foundation Programme which is a one year programme designed as a pathway to an undergraduate degree. Monash South Africa is one of the few higher education institutions in South Africa to offer a mid-year intake, which enables students to commence their degree in July. This means that students do not need to wait for 2015 to start their degree. During the second semester’s orientation week beginning on July 28th, new students will be invited to sign up for Community Engagement projects. As part of the Mandela Month initiative Monash South Africa will partner with four under-resourced schools in Zandspruit, Diepsloot and Cosmo City. Volunteers will read to pupils, stack books in libraries and clean and refurbish desks. Article issued by Monash SA. To view their profile on SAstudy, click here.